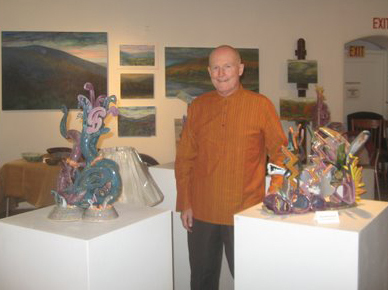 Jan Bopp, one of our multi-talented instructors, with some of his fabulous work this past weekend as part of an pottery/ceramics exhibit at Beaver Mill in North Adams. Jan has been studying pottery with noted ceramic artist Ray Bub whose exotic reconstructed teapots take pottery into a whole new art form. Using techniques he learns at class, Jan creates his own expressive artwork in clay.